Splinter Group - "Blowing Down Blue Sky"
I was a big Shadowfax fan years ago and remember how excited I was to see them perform live at the Montreaux Jazz Festival in 1985. But until now that was my only experience with guitarist G.E.Stinson, who according to his web site has been active with various projects over the years. 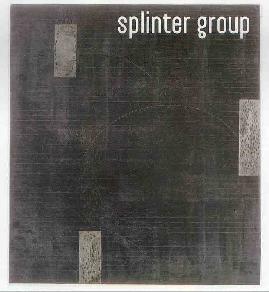 Splinter Group is a quartet that creates a killer freaky blend of avant-funky jazz, drum n bass, and exploratory free-improv styled sound-art and soundscapes. The band consists of Stinson on ex tech guitar (not sure what that is) and electronics, Kaoru on voice, electronics, toys and objects, Steuart Liebig on contrabass guitars (can't quite picture that), applied tools and tech, and DJ Chowderhead on turntables and minidisc. The CD opens with "Spoon", an avant-funk mixture of early Material, Golden Paliminos and electric Miles. The music is funky but within a dark and ominous atmosphere, with heavy drum n bass elements and lots of drones, clattering, and assorted other free-improv sounds. "Blowing Down Blue Sky" is similar, but with the added rocking aggression of the classic Massacre trio, and even a brain blasting funky industrial edge. "Egg Shell Necklace" is a funky jazzy soul song, but firmly in the same avant-garde realm that "Spoon" explored. Stinson's guitar comes across as a blend of 70's funk and Fred Frith, which all fits very nicely with the trip-hop and harsh soundscapes. And I love the sax solo which apparently is not actually a sax. "Snowman #1" is one of my favorite tracks of the set. Soulful vocals are backed by a parade of electronic whimsy and noodlings that remind me of Sun Ra in his experimental days. Bits of funk guitar and turntablisms mix it up with a get down funky but highly chaotic trip groove. I lost track of Laswell years ago but this is the direction he seemed to be heading, though this is far cooler than anything I heard him do when I was following his work in the 80's. Noise, soundscapes, sound-art mayhem, space freakouts and cool grooves all come together to create a sonic attack of the most trip funky kind. Imagine Miles and Sun Ra gone avant free-improv with Hawkwind as their backing band and you'll get something like this 16 minute trip. Why pay the Russians 20 million for a trip to space when you can put on the headphones and give this sucker 2 or 3 spins! "Shadow" is the most purely atmospheric track of the set, though it's also heavily laced with percussion and various sounds, as well as interesting guitar manipulations. And "Sleeping" consists of strange ethnic percussion and guitar patterns, playful voices and rhythms, and a generally freeform chaotic jam. The tension, pace and volume build gradually until becoming quite frenzied around the 4 minute mark. The music transitions continually throughout the tracks 16 minute length. Whining drones and wind tunnel effects create a massive wall of sound. Avant-rock sound-blast freakouts make mush of your brain. There's a steady linear guitar pattern that keeps a calm pace while considerably more aggressive guitar bursts lead the attack from all angles. And what sounds like the entire Broadway cast of Stomp join in the fun for a full ensemble dance on your spine. Lots happening here and loads of interesting ideas, though it took several listens and much aural digestion for me to warm up to this track... certainly the most challenging of the set. In summary, Splinter Group are really on to something, blending space funk grooves, sound-art, and avant-garde free-improv explorations into something very much their own. Step right this way for a funky, dancey, cosmic, brain shattering experience. For more information you can visit: http://wdtchc.com. More detailed information about G.E.Stinson can be found at: http://obstacle.com/ge/coded.php. Contact via snail mail c/o wdtchc; PO Box 261762; Encino, CA 91426-1762.